Home > Mark Your Calendar!!! > Race Track Chaplaincy of America, New York Division: Annual Basketball Game in Saratoga. 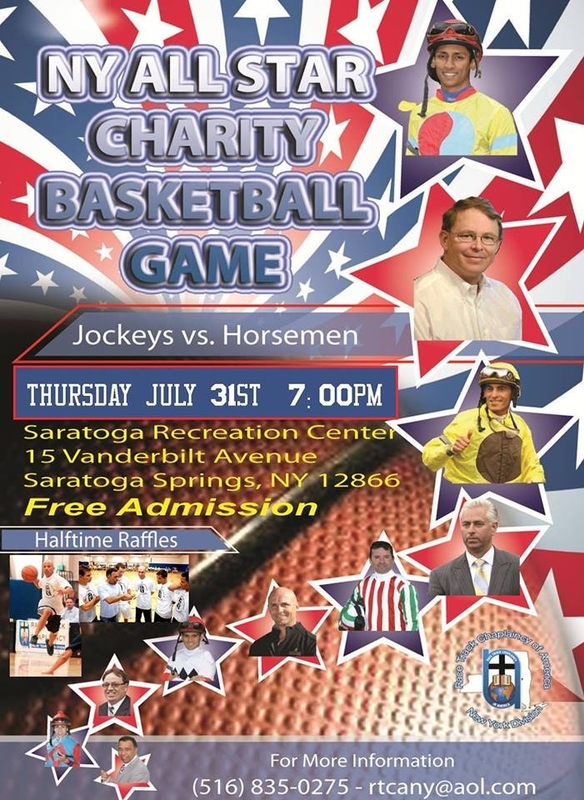 Tomorrow evening, Thursday, July 31, the New York Division of the Race Track Chaplaincy of America, will host their annual basketball game in Saratoga. Really, there’s no one on Earth who works harder or with more love and compassion than Chaplain Humberto Chavez; his wife, Karen; Nick Caras and their team. I could write a book about all that the Chaplaincy brings to the lives and spirits of the hundreds–thousands?–of people who work with the horses at our three NYRA tracks. I hope that you’ll attend the game. It’s slated to be Jockeys vs. Horsemen. 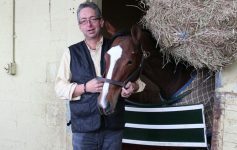 I heard a yummy rumor that Dean Reeves–who owns Mucho Macho Man with his wife, Patti and the Stronach Group–is playing on the Horsemen’s team. I was all psyched because my friend–like a niece to me, really–Trainer, Abigail Adsit–was slated to play on the Horsemen’s team, as well. But today one of her beautiful horses, Lavender Road, went down at Saratoga just before the race, and is now being treated at Rood & Riddle here in Saratoga. My prayers and those of thousands of others are with Lavender Road tonight, and with Abigail and all Lavender’s connections. So I rather doubt that Abigail will play tomorrow night, unless Lavender gets a clean bill of health or otherwise shows that she’s going to be fine. I’m sure that Abigail’s emotions have been put through a wringer today. Abigail may or may not be there. 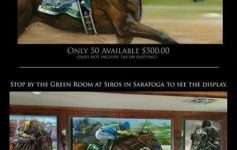 But some of your favorite Horsemen and Jockeys will be. There’s really no reason for you not to be there too, right? Come on out for a fun evening of basketball, as only racing professionals can take it off the track and into the Rec. Be there, of be rhomboid. Previous Article Using Horses as Props. What Fresh Hell is This?